If the outstanding work on solutions to child poverty, commissioned by the Children’s Commissioner Dr Russell Wills, along with work by community social service organisations, public health experts, local government and philanthropists is anything to go by, New Zealand’s soul is in great shape. Child poverty matters to New Zealanders, and there are a whole lot of people actively doing something about it, and the list is growing. It’s when we turn to our political and economic structures that we become a bit unstuck. From this angle, New Zealand’s soul suddenly looks jaded and rather shallow. And this contradiction is made all too clear when we turn to work recently released from the Office of the Commissioner for Children, and the Children Poverty Action Group. “will not be adequate given the magnitude of the challenge. Working in a piecemeal way, no matter how well-intentioned, is no way to tackle a complex problem like child poverty”. The report makes clear that if we are to make progress the government will need to move beyond funding ‘piecemeal remedial’ work to: 1) funding and implementation a strategy for investing in children 2) addressing income poverty 3) continuing momentum on housing and health. - Reviewable tenancy policy that move parents out of state houses to private rentals but it’s their children who must change schools and communities where there are good support systems in place (family/whānau/friends/church groups/community groups). - Welfare Reform policy that sanction parents for non-compliance but it’s their children who go to school without food. See here to read the full report. The absence of a measure of child poverty was a key issue raised by the EAG in its Report (August 2013). 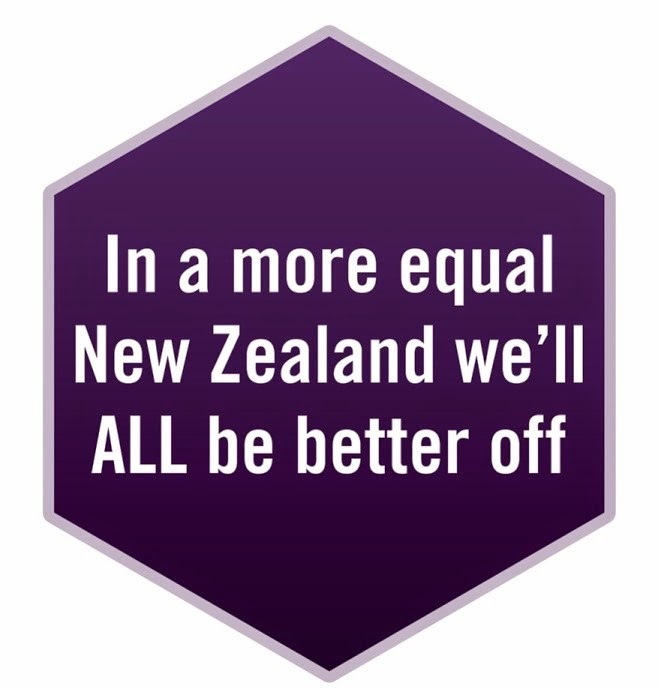 A year on and New Zealand is still without a measure, and now without government support. Not to be deterred though our valiant Children’s Commissioner is going it alone after securing $500,000 philanthropic funding to support work needed to measure and monitor child poverty and will produce an annual poverty report. Does it matter that this pivotal work is sponsored by a charity and not the state? The answer depends on what work is seen to be in the national interest. $5 million given just like that to keep key personnel of Emirates Team New Zealand employed, while they try to find funding for another America's Cup Challenge, clearly has more benefit to the national interest than funding pivotal work to reduce child poverty that will improve the living conditions of 265,000 children. Work that will have an on-going benefit to these children, and their children’s children. How could a child poverty measure possibly be in the national interest !!! For more information on why we need a child poverty measure listen to Kathryn Ryan’s Radio NZ interview with Professor Jonathan Boston Co-Chair of the Expert Advisory Group (EAG) and Susan Wood’s Interview with the Children’s Commissioner Dr Russell Wills. Benefit Sanctions : What’s the Impact on our Vulnerable Children ? The Child Poverty Action group (CPAG) has released a new report on Benefit Sanctions and the Impact on Vulnerable Children and it makes sombre reading with its warning that benefit sanctions are “creating a new class of economically vulnerable, invisible and unequal children”. The report notes official data on the impact of benefit sanctions is not readily available, and the report itself relied on limited information derived from an Official Information Act request. The scant information in the report is nevertheless concerning - 13,000 parents with dependent children have had their benefits cut for failing work tests in the first two and a quarter years of the new rules. However, official data remain silent on the impact of the sanctions on affected children. Surely it’s time for a transparent monitoring and evaluation process on benefit sanctions that is made publicly available. Otherwise, how do we understand any unintended consequences that might need to be carefully managed (ie increased child vulnerability), or assess the effectiveness of benefit sanctions (over benefit incentives). It seems ironic that at a time when child vulnerability is firmly on the political landscape, we still have policies that actively work against improving the lives of some of our most vulnerable children…..
Submissions to the Social Service Committee on the Vulnerable Children Bill have now closed. NZCCSS made a substantive submission with a range of recommendations . commended the intent of this Bill to improve the well-being of New Zealand’s most vulnerable children, and to establish cross-agency collaboration, joint responsibility and accountability for vulnerable children. the potential for unintended consequences of the Bill on some vulnerable children and their families and whānau. In the May Budget, the Government announced additional funding $20million for home support over 4 years. It has spent six months trying to figure out how to spend that extra $5million per year. In the end the Minister has announced a compromise that will see the DHBs (such as Whanganui DHB) that pay prices that are “below average” increase their contract payment to providers and other DHBs spend the money on those older people living at home with higher & more complex needs. The home support sector will welcome this additional money but it is a tiny amount to address a large issue – how to raise the wages and improve the conditions of home support workers who are needed to support the increasing number of older people needing this service. Grey Power and the NZ Aged Care Association have issued a media release calling for an Aged Care Commissioner to investigate financial abuse of older people. Financial abuse is a real problem but Age Concern would rather see more money put into the elder abuse prevention services they run. A Treasury Report on the Living Wage was released last Friday by Deputy Prime Minister Bill English with the claim that it “would not work” in NZ. Which seems pretty strange, as it works just fine in other places such the UK, USA and Canada. Annie Newman from Living Wage Aotearoa was quick to respond and ask just how the government wants to lift wages. Is the Carer Support Subsidy Working for You? The Ministry of Health is seeking the views of unpaid carers of people with disability who currently receive the Carer Support Subsidy, as part of a review of the adequacy and flexibility of the subsidy. The Ministry wants to better understand how you use CSS, how you might supplement it (e.g., using your own money), and the difference the subsidy makes to you as a carer. The Ministry also wants your views on how the Subsidy could be changed or improved to work better for you. Following is a link to a short survey that KPMG is administering for the Ministry of Health. The survey should take less than 10 minutes to complete, and your responses will provide valuable input into this important project. The survey will be open from Monday 4th November until Friday 20th December 2013. Seeking or offering support at home? Join the MyCare advisory panel! The University of Auckland Faculty of Medical and Health Sciences is seeking family carers to participate in a significant new study. If you support an ill, disabled, or frail friend or family member, please share your experiences in this study, which will give carers a stronger voice and greater visibility. Please click here to complete the online State of Caregiving Survey, which will be repeated annually for three years, and encourage any of your carer friends to also complete the survey. Here is a one page letter from Tracey-Lee Dalton, the researcher who is leading the study. The Well Child/Tamariki Ora Programme Practitioner Handbook (the Handbook) has been developed to assist all providers who deliver Well Child/Tamariki Ora (WCTO) services. It merges information from a range of existing practitioner resources including the Well Child/Tamariki Ora Handbook (Ministry of Health 2002d), The B4 School Check: A handbook for practitioners (Ministry of Health 2008e) and the National Vision and Hearing Screening Protocols (Ministry of Health 2009b). It also summarises and links to key documents and resources that include but are not limited to Family Violence Intervention Guidelines (Ministry of Health 2002a), Healthy Smile, Healthy Child: Oral health guide for Well Child Providers (New Zealand Dental Association 2008), NZ–World Health Organization (WHO) growth charts and related fact sheets and guidelines for newborn screening. Check out the latest housing research on legal protection for tenants. The Paper Walls Report analyses the laws that are meant to keep rental housing healthy in Aotearoa New Zealand. This is an excellent piece of research from Anglican Life. The Government Guide for Carers booklet was recently updated and covers topics of interest to family carers including financial help, needs assessment, equipment, taking care of yourself, help with managing bowel and bladder issues, and much more. When placing an order please ensure you include both a physical and postal address for delivery purposes. Hosted by NZEI and Living Wage Wellington. Speakers include: Mayor of Wellington, city councillor, rep from ‘Every Child Counts. Thursday 7 November, St Johns in the City, cnr Willis and Dixon St.7pm for light refreshments, meeting starts at 7.30pm. Learn about the impact of poverty on children and the education environment, Wellington City Council’s next step to implement a living wage, and how you can be part of the fight against poverty in Wellington.